Your body requires sodium for a variety of important functions and processes. However, too much sodium in your diet can result in high blood pressure and other health problems. The Recommended Dietary Allowance, or RDA, for sodium is the average intake level of what you should be getting from your diet daily. Consult a registered dietitian for your specific nutritional recommendations and guidelines. The RDA for sodium is currently no more than 2.3 g, or 2,300 mg, of sodium daily for healthy adults. That is equivalent to about 1 tsp. of salt a day. According to the Institute of Medicine, the maximum daily intake for sodium are the following: ages 1 to 3, 1,500 mg; ages 4 to 8, 1,900 mg; ages 9 to 13, 2,200 mg, and ages 14 to 18, 2,300 mg. People who are sensitive to sodium should only consume 1,500 mg of sodium per day. Sensitive populations include adults over 50, blacks or those diagnosed with hypertension, diabetes or chronic kidney disease. The Dietary Guidelines for Americans recommends preparing your foods with very little salt and emphasizing fruits, vegetables and other potassium-rich foods. Potassium is a mineral essential for good health, and high amounts in your diet can counteract some of sodium's effect on blood pressure levels. In small amounts, sodium is essential for normal nerve and muscle functioning. It is also required for the proper balance of fluids in your body. Unfortunately, most Americans get more sodium than they need. Too much sodium in your diet can result in a sodium buildup in your bloodstream. If left untreated, high levels of sodium can lead to many diseases, such as high blood pressure, heart disease, stroke and kidney disease. Commercially processed and prepared foods provide the most sodium in the typical diet. Examples include many breads, prepared dinners, cold cuts, soups, rice, cheese and fast food. In addition, condiments such as soy sauce, ketchup, salad dressings and other sauces also provide high amounts of sodium. 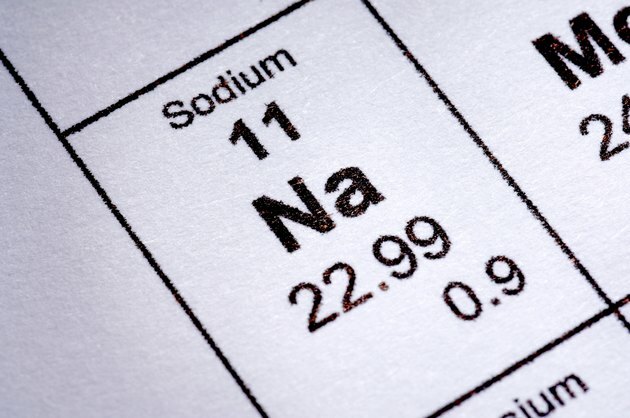 Sodium is found naturally in many foods, such as fruits, vegetables, dairy and legumes. For example, a processed soup may provide 700 to 1,260 mg of sodium, while frozen vegetables may provide only 2 to 160 mg of sodium. Consume more fresh foods, since most processed foods provide high amounts of sodium. Season your foods with your favorite herbs and spices instead of table salt. Flavorful salt substitutions for vegetables include citrus zest, rosemary, cilantro, mint, parsley, garlic and onion. For various meats, you can use garlic, curry powder, sage, thyme, lemon juice or oregano instead of salt. Read food labels carefully; choose products that provide less than 300 mg of sodium per serving. Food packages that read "sodium-free" or "low sodium" provide less sodium than do their non-sodium-restricted counterparts. Reduce salt from your diet gradually over a period of a few weeks so your taste buds can adjust.